SARChI Chair of Mathematics Education, School of Education, University of the Witwatersrand, South Africa. 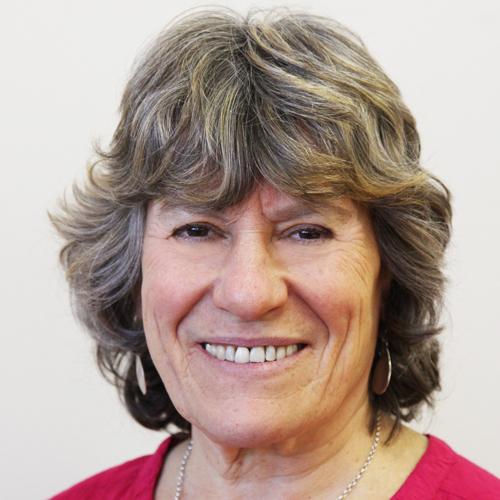 Jill Adler holds the SARChI Mathematics Education Chair at the University of the Witwatersrand, which focuses on research and development in secondary mathematics education, and is the 2017-2020 President of the International Commission on Mathematical Instruction (ICMI). Jill has spearheaded several large-scale teacher development projects, the most recent, within the Chair ambit, begun in 2009, is called the Wits Maths Connect Secondary project. This work builds on her research on teaching in multilingual classrooms, and teacher professional development. Jill is a Visiting Professor of Mathematics Education at King’s College London, UK. She is the recipient of numerous awards, the most significant of which are the 2012 Academy of Science of South Africa (ASSAf) Gold Medal for Science in the Service of Society, and the 2015 Freudenthal Award. In recognition of a major cumulative program of research and its impact. Department of Mathematics and Science Education, University of Stockholm, for research that has made a significant and lasting contribution to the Department’s research and teacher education. Awarded to the Mathematics Education Unit that in 2003 was under my leadership. Adler, J., & Sfard, A. (2017). Research for educational change: Transforming researchers' insights into improvement in mathematics teaching and learning. Abingdon: Routledge. How can educational research fulfill its commitment to educational practice? This time-honored question is the one that gave rise to this book. The more specific query of how to bridge research and practice in conditions of poverty and inequality became its main focus. Within the context of mathematics education, this single, all- encompassing problem can be decomposed into three separate issues, each of which is serious enough to keep researchers awake at night. First, how can one explain the lingering, pervasive failure in mathematics experienced by so many students around the world, but especially by those who live in conditions of scarcity and social injustice? Chapter 4, in Adler, J., & Sfard, A. (2017). Research for educational change: Transforming researchers' insights into improvement in mathematics teaching and learning. Abingdon: Routledge. In this chapter, we use an analytic framework called Mathematical Discourse in Instruction (MDI) to investigate and describe the opportunities for learning to solve quadratic inequalities in Mr T.s lesson event. MDI brings to the fore two commonplaces of mathematics teaching: exemplification and explanatory talk that together can, and in our view should, enable access to scientific concepts (Vygotsky, 1978). Our analysis shows potential across examples for relating equations and inequalities, and for connecting different representations of the solution to a particular quadratic inequality, but this was thwarted by the accompanying explanatory talk, by how Mr T. legitimated the solution strategy he offered in the lesson, and in how he named what he talked about. Consequences follow for learning and, we will argue, deliberate work across research and practice. Chapter 8 in Adler, J., & Sfard, A. (2017). 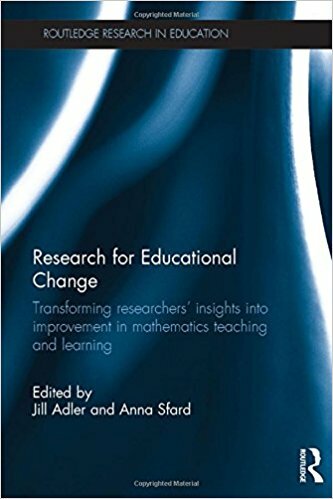 Research for educational change: Transforming researchers' insights into improvement in mathematics teaching and learning. Abingdon: Routledge. In this chapter we use a different lesson, a lesson that was taught by another teacher, Ms H, who also participated in the WMCS professional development (PD) project. It was taught more than a year after the video of Mr T’s lesson was taken. In the intervening time, the WMCS teachers learned about the benefits of well-structured example sets for their students’ learning in the PD. The teachers also had opportunity to work on what was a good explanation or justification for a particular concept or procedure, and on why the words you use to talk about mathematical ideas in class are important. Our purpose here is to move from the analysis in Chapter 5 to our interpretation of this for our PD work. This article reports a review of research in mathematics education in South Africa published in local and international journals in the period 2007–2015. The purpose of the review was to describe the landscape of mathematics education research in the country over the past (almost) decade. Findings indicate that the mathematics education research community has become more established, expanding quantitatively, with the number of articles identified being nearly double, in absolute terms, that in a similar review of research from 2000 to 2006. Trends identified in the earlier review persist, with a dominance of publications in local journals and on small-scale qualitative studies on secondary teaching and learning. There is, importantly, an increase in research on primary mathematics. The review includes critical reflection on these findings, opportunities and threats, new and old, and what these mean for the future of research in this field. The influences on governments for policy changes in schools range across many agencies, including the political party in power. When policies change, the sources of these influences are not always clear. The project whose work is presented in this special issue examines what these changes look like in terms of the differences in assessment tasks of school pupils’ mathematics, over time. In this article we attempt to develop a graph, which we argue will have general applicability internationally, that can help to reveal the sources and nature of those influences. We construct the graph in interaction with an examination of the most recent changes in two countries. We argue that our analysis is a necessary complement to the project’s findings in that it enables us to identify the fields of recontextualisation, their relative strengths in terms of influence and hence conjecture their impact on the mathematics curriculum. In this paper, we propose an analytic tool for describing the mathematics made available to learn in a ‘textbook lesson’. The tool is an adaptation of the Mathematics Discourse in Instruction (MDI) analytic tool that we developed to analyze what is made available to learn in teachers’ lessons. Our motivation to adapt the use of the MDI analytic framework to textbooks is to test the relative robustness of the framework in moving across different pedagogic texts (e.g. video of a lesson, a textbook lesson). Our initial findings suggest it has applicability across pedagogic texts, thus opening possibilities for using a common framework and language in research and in professional development activities involving the written and enacted curricula. We describe and use an analytical framework to document mathematics discourse in instruction (MDI), and interpret differences in mathematics teaching. MDI is characterised by four interacting components in the teaching of a mathematics lesson: exemplification (occurring through a sequence of examples and related tasks), explanatory talk (talk that names and legitimates what comes to count as mathematics in a particular lesson), learner participation (interaction between teacher and learners and amongst learners) and the object of learning (the lesson goal). MDI is grounded empirically in mathematics teaching practices in South Africa, and theoretically in sociocultural theoretical resources. The MDI framework allows for nuanced descriptions of mathematics teaching and interpretations of differences in what is mathematically made available to learn. Mathematical problems that make links to the everyday and to disciplines other than mathematics—variously referred to as practical, realistic, real-world or applied problems in the literature—feature in school and undergraduate mathematics reforms aimed at increasing mathematics participation in contexts of inequity and diversity. In this article, we present a micro- and macro-analysis of a prototypical practical problem in an undergraduate mathematics course at a South African university. This course offers an alternative route to a mathematics major for students considered disadvantaged by enduring educational inequalities in South Africa. Using a socio-political practice perspective on mathematics and critical dis- course analysis—drawn from Norman Fairclough’s critical linguists—we describe what mathematics and mathematical identities practical problems make available to students and compare this to what is valued in school mathematics and other university mathematics courses. Our analysis shows that these practical problems draw in complex ways on sometimes contradictory practices in the wider context, requiring the student to work flexibly with the movement of meaning within and across texts. We raise for further consideration the possible consequences of this complexity and offer suggestions for practice that take into account issues of power. The purpose of this paper is to illustrate the methodology used by the authors to describe the enacted object of learning, a methodology where data production and analysis is rooted in a theorisation of pedagogy. The authors share how the authors used this methodological approach to provide a comprehensive description of the enacted object of learning and in so doing the authors hope to make a methodological contribution to the field of learning study. The lesson analysis foregrounds the importance of “evaluation” in pedagogic practice, and thus a key element of pedagogy. Tools from variation theory are incorporated into this broader approach that the authors suggest illuminates the enacted object of learning. The authors offer this approach as a methodological contribution to the development of research in and on learning study. Can improving teachers’ knowledge of mathematics lead to gains in learners’ attainment in Mathematics? It is wellknown that the majority of South African learners achieve extremely poorly in Mathematics. Many claim that one of the causes of this poor attainment is teachers’ weak knowledge of mathematics, and propose that improving teachers’ mathematical knowledge would improve learner attainment. However, the evidence-base for this proposed solution is currently relatively weak. We report on a quasi-experimental study examining the learning gains of Grade 10 learners from five secondary schools in the Johannesburg area, whose teachers participated in a year-long professional development course aimed at improving the teachers’ knowledge of mathematics for teaching. Statistical analyses of pre- and post-test results show that the intervention group of learners (N = 586) taught by teachers who had participated in the professional development (N = 14) outperformed a matched control group of learners (N = 217) taught by teachers in the same schools (N = 7). An effect size of 𝑑 = 0.17 for the intervention group is equivalent to two months’ additional progress. While the learning gains are small, they are statistically significant. These findings provide empirical support for claims that attending to teachers’ mathematical knowledge can impact learners’ attainment. Suggestions are made regarding the form and substance of such professional development. The central concerns of this chapter are the examples and accompanying explanations teachers offer as they elaborate mathematical ideas in their classrooms. We contend that these two commonplace features of mathematics teaching are critical elements of what we have come to describe as teachers’ mathematical discourse in instruction (MDI). In previous writing (Venkat & Adler, 2012), we focused on MDI through the representations, transformations and accompanying explanations given by teachers as they worked with specific examples. I will develop and then reflect on two inter-related claims in this chapter. The first is that the sets of concepts that have emerged through research on mathematics knowledge for teaching (MKT), while relatively recent, have nevertheless proliferated. This is not surprising given that as part of educational knowledge, it is part of a horizontal knowledge structure with a relatively weak grammar (Bernstein, Br J Sociol Educ 20(2):157–173, 1999). The second is that a key ‘new’ position producing and produced by this knowledge development is that of mathematics-teacher-educator-researcher working simultaneously as knowledge producer and recontextualiser in the university. A number of questions, about research and practice emerge from the grammar of MKT and the dual, perhaps ambiguous positioning of its agents. This chapter thus offers a story about mathematical knowledge for teaching framed by Steve Lerman’s contributions to the field, and the possibilities evoked for further work. This article reports an investigation into how students of a mathematics course for prospective secondary mathematics teachers in England talk about the notion of ‘understanding mathematics in depth’, which was an explicit goal of the course. We interviewed eighteen students of the course. Through our social practice frame and in the light of a review of the literature on mathematical knowledge for teaching, we describe three themes that weave through the students’ talk: reasoning, connectedness and being mathematical. We argue that these themes illuminate privileged messages in the course, as well as the boundary and relationship between mathematical and pedagogic content knowledge in secondary mathematics teacher education practice. In this paper, we focus on an initiative in England devised to prepare non- mathematics graduates to train as secondary mathematics teachers through a 6-month Mathematics Enhancement Course (MEC) to boost their subject knowledge. The course documentation focuses on the need to develop “understanding mathematics in-depth” in students in order for them to become successful mathematics teachers. We take a poststructural approach, so we are not interested in asking what such an understanding is, about the value of this approach or about the effectiveness of the MECs in developing this understanding in their participants. Instead we explore what positions this discourse of “understanding mathematics in-depth” makes available to MEC students. We do this by looking in detail at the “identity work” of two students, analysing how they use and are used by this discourse to position themselves as future mathematics teachers. In doing so, we show how even benign-looking social practices such as “understanding mathematics in-depth” are implicated in practices of inclusion and exclusion. We show this through detailed readings of interviews with two participants, one of whom fits with the dominant discourses in the MEC and the other who, despite passing the MEC, experiences tensions between her national identity work and MEC discourses. We argue that it is vital to explore “identity work” within teacher education contexts to ensure that becoming a successful mathematics teacher is equally available to all. Teachers’ mathematical discourses in instruction (MDIs), essentially the mathematical aspects of what teachers say, do and write as they interact with learners in mathematics classrooms, are a key feature of classroom practice. Typically, these MDIs include a problem, a selected representation that is subsequently transformed, and explanations and justifications for the representations selected and transformations performed. Our interest in this article is in developing a language that can be used to describe a range of MDIs. This interest is driven by our need to understand MDIs that seem to us to disrupt coherence and connection in mathematical text in a range of ways, and thus impact on what mathematics is made available to learn. What is important for this transformation activity1 is that within the MDI, the input representation introduced, the representations produced through transformation activity, and the accompanying explanations connect with each other and cohere with the stated problem. Our observations, across primary and secondary classrooms within our respective projects, suggest that such coherence or connection is frequently, but varyingly, disrupted within MDIs. In this article, we share our development of an empirically derived analytical language (elements of which are italicised above) that allows us to make visible a range of disruptions to connection and coherence that come into play across four contrasting teaching episodes. We focus here on input objects, transformational activity and accompanying explanations in order to ‘see into’ the micro-level production of mathematics in classrooms through describing differences in the nature and degree of coherence and connection and to consider the consequences for what is made available to learn. This micro-level focus on specific episodes within lessons follows our observation of the occurrence of disruptions at this level, rather than at the broader level of lessons or lesson sequences that have been taken up in prior research (e.g. Sekiguchi, 2006). In order to present our thinking on making aspects of connection and coherence visible within transformation activity, we begin with a brief overview of the literature. We draw on writing focused on transformation activity and representations as these actions and objects are at the centre of all our episodes and, as noted already, at the heart of mathematical activity more generally. We also summarise evidence that points to the shortcomings that characterise practices in which transformation steps are emphasised at the expense of gaining understanding of the representations they act upon. From this review, we outline the key concepts that we found helpful in beginning to pull apart some of the range of procedural practices that we were working with. Centrally, we home in on the stated problem, the selected input representation, subsequent sequences of transformation steps, and the interim and final representations produced in this sequence. These concepts are all covered in the literature we review. Somewhat absent in this literature is a focus on the MDIs that accompany transformation activity. Teaching involves the giving of accompanying explanations alongside transformation and so, unlike the (often predictably) piecemeal learner discourses that are in focus in much of the literature on transformation-oriented activity, one expects MDIs to be both coherent and connected, and to provide some of the rationales for the representations selected and transformation activity that is enacted. As noted above however, we see this expectation disrupted relatively frequently, and in a range of different ways. In order to consider the nature of these disruptions to coherence, we use a tentative set of framing questions, drawn from our grounded analysis of the episodes presented in this article, to analyse and differentiate the transformation activity in four selected teaching episodes. This could be criticised as somewhat circular: developing grounded framing questions from a dataset, and then using them to analyse the same dataset. Our aim in doing this is to share this set of literature-drawn concepts and grounded framing questions in order to start conversations across the mathematics teaching and teacher education communities that can help to build a more robust language for thinking about what constitutes coherence and connection within mathematics teaching. We have already been through several iterations of concepts and framing questions, and have seen that our current formulation can be applied to a significantly broader group of episodes that we have encountered. In this paper, we put Basil Bernstein’s theory of pedagogic discourse to work together with additional theoretical resources to interrogate knowledge and practice in mathematics teacher education. We illustrate this methodology through analysis of an instance of mathematics teacher education pedagogic practice. While the methodology itself is our focus, the particular example provides a compelling story at the heart of which is the problem of integration of knowledge(s) within a pedagogic practice. Here, a constructivist pedagogy is at work, but differentially with respect to teaching/learning mathematics and teaching/learning mathematics teaching. The example illuminates mathematics and teaching, and their co-constitution in a particular pedagogic context. This paper interrogates the recontextualisation of available assessment items developed for research purposes that measure mathematical knowledge for teaching, into scenarios for use in qualitative studies related to mathematics teachers’ subject matter knowledge. It draws from interviews with teacher participants in the Wits Maths Connect-Secondary project and their responses to two selected items from the Learning Mathematics for Teaching (LMT) project. 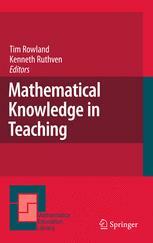 The analysis shows that carefully constructed multiple choice items in the domain of (mathematics) subject matter knowledge have much potential in provoking teachers’ talk and their mathematical reasoning in relation to practice-based scenarios; and exploring with teachers a range of connected knowledge related to the teaching of a particular concept or topic. We argue that productive use of such items further requires that researcher make explicit the mathematical ideas they expect to explore and assess in the developed items. This book, and the range of chapters within it, take as its starting point the role of curriculum resources in mathematics teaching and its evolution. Teachers draw on a wide range of resources as they do their work, using and adapting these in various ways for the purposes of teaching and learning. At the same time, this documentation work (as it is referred to by Gueudet and Trouche, Chapter 2) acts back on the teacher and his or her professional knowledge. Documentation work is a function of the characteristics of the material resources, teaching activity, the teachers’ knowledge and beliefs, and the curriculum context. The chapters that follow explore and elaborate this complexity. An underlying assumption across chapters is an increasing range of textual resources for teaching and wide availability of digital resources. The empirical work that informs this chapter took place in mathematics classrooms with limited textual and digital resources, and it is this kind of context that gave rise to a broad conceptualisation of resources in mathematics teaching that included the teacher and her professional knowledge, together with material and cultural resources, like language and time. In Adler (2000) I describe this broad conceptualisation, theorising material and cultural resources in use in practice in mathematics teaching in South Africa. The discourse used is of a teacher ‘re-sourcing’ her practice – a discourse with strong resonances in documentation work. This chapter builds on that work, foregrounding and conceptualising professional knowledge as a resource in school mathematics teaching. I begin by locating our concern with knowledge resources, a discussion that leads on to the methodology we have developed in the QUANTUM1 research project to adequately describe their use in mathematics teaching. This current research has as its major question, what and how mathematics comes to be constituted in pedagogic practice? Professional knowledge in use in practice, and how this shapes what is made available for learning, come into focus. The methodology we have developed is then illustrated through recent empirical work in two secondary mathematics classrooms in South Africa. These illustrations add force to the argument for foregrounding knowledges in use in descriptions of classroom practice and teachers’ interactions with resources. Moreover, while the methodological tools offered here emerge in response to a particular context, related data and theoretical gaze, they are, I propose, useful for studying the evolution of knowledge resources in use in teaching across contexts. Teachers involved in action research in mathematics classrooms typically focus on their pedagogical practice, and rarely challenge the mathematical content of their teaching. The first part of this article supports this claim in terms of an analysis of the teachers-as-researchers movement. It then reports on a study where teachers were researching aspects of mathematics for the teaching of limits of functions, in which mathematical and pedagogical issues were intertwined. The aim of the study was to analyse how teachers’ mathematical knowledge evolves through their participation in a research project. The study showed that whilst their knowledge evolved for some aspects of limits during the research process this was not the case in two crucial aspects of this knowledge: the ε-δ definition and the graphical representation of limits. Furthermore, the study revealed the discomfort of an experienced teacher when facing challenges to his own mathematical knowledge and therefore the content of his teaching. The QUANTUM research project in South Africa has as its central concern answering the question of what is constituted as mathematics in and for teaching in formalised in-service teacher education in South Africa and how it is constituted. Entailed in the question is an understanding that, in practice, selections of content in mathematics teacher education are varyingly drawn from mathematics and the arena of education (including mathematics education, teacher education and teaching experience). Debate continues as to whether and how mathematics teacher education programmes should integrate or separate out opportunities to learn mathematics and teaching. Programmes range across a spectrum of integration and separation of mathematics and teaching, including variations in the degree to which opportunities for teachers to learn both mathematics and teaching are presented as embedded in problems of practice. In this paper, I argue that mathematics teachers’ professional knowledge matters, and so requires specific attention in mathematics teacher education. Two examples from studies of mathematics classrooms in South Africa are described, and used to illustrate what mathematics teachers use, or need to use, and how they use mathematics in their practice: in other words, the substance of their mathematical work. Similarities and differences across these examples, in turn, illuminate mathematics teachers’ professional knowledge, enabling a return to, and critical reflection on, mathematics teacher education. Bien sûr, un ensemble de recherches, en relation avec les thèmes développés ici, ont été réalisées depuis 2000. J’ai donc opéré des révisions mineures, principalement dans les premières sections, pour mentionner certaines de ces recherches et référer aux autres chapitres de cet ouvrage. Globalement, le chapitre demeure cependant proche de la version originelle. In this paper we describe and discuss the language practices of mathematics, science and English language teachers and learners in a sample of urban and rural, primary and secondary schools in South Africa. We focus particularly on the reception and production of language through code-switching, exploratory talk and discourse-specific talk. We situate the article in the policy and practice environment of post-apartheid South African education in which additive bi/multilingualism is officially advocated. We use the metaphor of a journey to describe how teachers and learners move from informal, exploratory talk in learners’ main languages to discourse-specific talk and writing in English. A key finding from our study is that few teachers and learners completed this complex journey and that the constraints differed across classroom context, level and subject being taught. In any education system, curriculum alone cannot fulfill reform demands imposed onto teachers to help learners make meaning of subject contents they learn. This paper revisits the notion of resources as explored in a mathematics teacher professional development project that focused on algebra learning. As a way to promote the use of manipulatives in teaching and learning algebra, the project introduced algebra tiles to participating teachers and investigated how the tiles facilitated the enaction of algebraic meanings. The participating teachers learned different ways of helping learners interpret and solve algebraic problems, with the use of algebraic tiles. In this paper, I illuminate the notion of mathematics for teaching (its matter) and argue that it matters (it is important), particularly for mathematics teacher education. Two examples from studies of mathematics classrooms in South Africa are described, and used to illustrate what mathematics teachers use, or need to use, and how they use it in their practice: in other words, the substance of their mathematical work. Similarities and differences across these examples, in turn, illuminate the notion of mathematics for teaching, enabling a return to, and critical reflection on, mathematics teacher education. 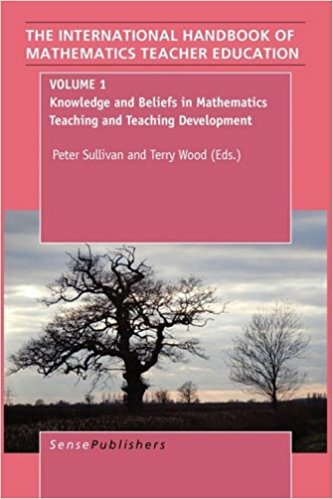 This chapter aims to show the impact of culture on the learning of mathematics and consequently that studies of mathematics for teaching require strong theoretical frameworks that foreground the relationship between culture and pedagogy. For this purpose, we describe two different research projects in Southern Africa, each focused on the notion of mathematics for teaching. The first study analyses teacher learning of the mathematical concept of limits of functions through participation in a research community in Mozambique, and is framed by Chevallard’s anthropological theory of didactics. The second, the QUANTUM project, studies what and how mathematics is produced in and across selected mathematics and mathematics education courses in in-service mathematics teacher education programmes in South Africa, and is shaped by Bernstein’s theory of pedagogic discourse. We argue that separately and together these two studies demonstrate that mathematics for teaching can only be grasped through a language that positions it as structured by, and structuring of, the pedagogic discourse (in Bernstein’s terms) or the institution (in Chevallard’s terms) in which it ‘lives’. Mathematics teacher education can be seen as directly related to activity in mathematics classrooms and the success (or other) of students learning mathematics worldwide. In what ways does what is published in the field of mathematics teacher education inform us about key question and issues, about programmes for educating teachers, and about research findings? We refer specifically to an International Congress on Mathematical Education (ICME) survey (with Adler as chair) and to the Journal of Mathematics Teacher Education (JMTE), the leading journal in the field (with Jaworski as editor in chief). We report on two case studies in which we investigated mathematics for teaching. We were interested in the mathematical knowledge teachers need to know, and know how to use, in order to teach mathematics well. The two case studies focused on the teaching of probability in Grade 8 and the teaching of functions in Grade 10. We discuss the mathematics for teaching probability and functions in terms of the mathematical ‘problem solving’ or ‘mathematical work’ demanded of the teachers as they taught the two topics. Among the findings are the interesting differences between the demands on the teaching of functions and the demands on the teaching of probability in these two cases. We argue that mathematics for teaching needs to be understood as shaped by the particular topic being taught, as well as by how teachers select to introduce and approach the ideas and concepts they are teaching. We conclude with a discussion of questions raised for mathematics teacher education, together with implications for practice. In this paper, we consider our use of activity theory to examine empirical data from a study of reform in England – the implementation of the mathematics strand of the Key Stage 3 Strategy in two schools. Our concerns are largely methodological – we consider the aspects of reform that more traditional activity theory methods and foci were able to theorise – questions related to “what” had changed, and then consider those aspects that were left aside – participants’ experiences of reform and the influences of broader dominant discourses relating to mathematics classroom practices. We then go onto show how concepts related to the notion of “boundaries” – boundary objects and boundary crossing can be used within an activity theoretical frame to theorise the gaps. We conclude by detailing the ways in which this expansion of foci adds to our understandings of policy implementation. In this paper we discuss our study of three instances of formalised in-service mathematics teacher education courses. We found that in varying ways, all courses draw in sensible experience by appealing to images of the teacher and teaching as a central resource for modelling the teaching and learning of mathematics. One of the courses also prioritises the image in elaborating mathematics itself. If, as we hold, intelligibility matters for principled reproduction of both mathematics teaching and of school mathematics in mathematics teacher education, then it matters how, in teacher education practice, the relation between sensible experience and the intelligible is regulated. We found that such regulation differed in significant ways across courses. Through the theoretical gaze we have brought to bear on them, the three instances of mathematics teacher education provoke challenging questions about the selections from mathematics and teaching in mathematics teacher education. In their description of the mathematical work of teaching, Ball, Bass & Hill (2004) describe the mathematical problem solving that teachers do as they go about their work. In this paper we add to this description through our study of teaching of probability in a grade 8 multilingual classroom in South Africa. We use instances of teaching to highlight the mathematical problem solving that teachers might face as they work with learners’ ideas, both expected and unexpected. We discuss the restructuring of tasks as an inevitable feature of teachers’ work, and argue that in addition to scaling up or scaling down of the task as Ball et al. (2004) describe, restructuring can also entail shifting the mathematical outcomes from those intended. We also point out how well known issues in mathematics education, for example working with learners’ everyday knowledge, and the languages they bring to class, are highlighted by the context of probability, enabling additional insights into the mathematical work of teaching. This article describes an investigation into mathematics for teaching in current teacher education practice in South Africa. The study focuses on formal evaluative events across mathematics teacher education courses in a range of institutions. Its theoretical orientation is informed by Bernstein’s educational code theory and the analytic frame builds on Ball and Bass’ notion of “unpacking” in the mathematical work of teaching. The analysis of formal evaluative events reveals that across the range of courses, and particularly mathematics courses designed specifically for teachers, compression or abbreviation (in contrast to unpacking) of mathematical ideas is dominant. The article offers theoretical and practical explanations for why this might be so, as well as avenues for further research. In this paper we examine two instances of the use of competence models in formalised in-service teacher education courses, finding that they prioritise the use of the visual as a central resource for the modelling of teaching mathematics and of the teaching and learning of mathematics. The way in which the visual is used in competence models produces an emphasis on the sensible that at the same time seems to disrupt the intelligible and so principled reproduction of mathematics teaching and of school mathematics. These instances of teacher education practice raise challenging questions about the selections from mathematics and teaching in mathematics teacher education. Phakeng, M., & Lerman, S. (Eds.) 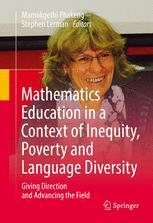 Mathematics education in a context of inequality and language diverstity: Giving direction and advancing the field. Springer: Switzerland. This volume is dedicated to the career of Jill Adler and the role she has played in growing mathematics education research in South Africa, Africa and beyond. Her work epitomises what is referred to as the ‘engaged scholar’: i.e. doing rigorous and theoretically rich research at the cutting edge of international work in the field which at the same time contributes to critical areas of local and regional need in education. Jill is one of the world’s leading experts in mathematics education research and her exemplary career is a continuous source of inspiration for generations of researchers and students. The chapters in this volume are authored by Jill’s former PhD students, a few select colleagues from different parts of the world that she collaborated with as well as leading scholars who she worked with in PME, ICMI and in her many international assignments. In essence, this volume celebrates Jill’s contribution not only to mathematics education but also to our contributions as her friends and colleagues. Topics covered include language and mathematics, teacher education, and the dilemma of an activist researcher engaging in issues that matter hugely to the participants in the research, students and teachers in post-apartheid schooling, whilst also setting up the separation that is needed for good research. Increasingly, teachers all over the world are grappling on a daily basis with the fact of multilingual classrooms. In this book, Jill Adler captures three inter-related dilemmas that lie at the heart of teaching mathematics in multilingual classrooms. Adler’s identification and naming of the dilemma of code-switching, the dilemma of mediation, and the dilemma of transparency, arise from exploring the realities of actual classrooms, and are shaped by a perspective of teaching as a social practice. 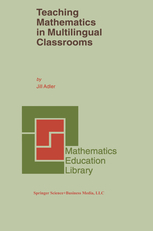 Adler provides a sharp analysis and strong theoretical grounding for her work, pulling together research related to the relationship between language and mathematics, communicating mathematics, and mathematics in bi-/multilingual settings. In so doing, she offers a direct challenge to dominant research on communication in mathematics classrooms that has `othered’ the multilingual setting in its normalisation of the monolingual classroom. The `norm’ is a multicultural one. Set in contemporary South Africa – a context of linguistic diversity and rapid change – this book offers a spotlight whose beam is wide enough to illuminate dilemmas at work in all mathematics classrooms. In this chapter, we draw substantially on Wenger’s (1998) Communities of Practice (CoP) theory to develop and then propose a methodological approach for analysing pre-service mathematics teacher education multilingual classrooms. The approach emerged in Essien’s (2013) study that investigated how pre-service mathematics teachers were being prepared to teach mathematics in multilingual contexts. Like many others in mathematics education, the theoretical frame for the study drew from a disciplinary domain in the social sciences to investigate the teaching and learning of mathematics. But why Wenger, and his theory of learning through participation in a community of practice, particularly given that Wenger’s CoP theory was developed from studying informal learning settings? The theoretical journey that led us to Wenger began in a situated frame to enable us to bring to the fore the multilingual context in which pre-service mathematics teacher education in South Africa occurs, and in which prospective teachers will teach (e.g., Brill, 2001). We soon realised, however, that cognition was central to this work. Our concerns, however, were more with teaching and learning practices in teacher education, and not teacher educator thinking. Given our interest in foregrounding multilingualism, and our orientation to this as a resource and not a problem (Adler, 2001), we went on to explore the potential of sociolinguistic theory (Eggins, 2004) for this study. This more discursive approach brought with it a detailed focus on classroom discourse, backgrounding the classroom community as we came to view it. It was through this process of engagement with a range of theoretical resources with potential to illuminate language practices in mathematics teacher education in a context of multilingualism, (coupled with pilot empirical work in teacher education institutions), that we came to appreciate multilingual mathematics teacher education classrooms as complex communities. Such classrooms have diverse participants, roles and motives, and so we returned to our initial orientation to learning and teaching as situated. Hence we drew instead on Wenger and his more explicit and stronger social situative/practice theory, together with others who have argued its salience for studying teacher learning. In this paper we draw on two research projects in South Africa to describe and discuss the language practices of teachers in primary multilingual mathematics classrooms. We focus particularly on code-switching – moving across languages and discourses. We situate the paper in the policy and practice environment of post-apartheid South African education in which code-switching is encouraged. Through our descriptions and discussion, we argue that while at a general political and pedagogical level it makes sense for teachers to encourage and use code-switching as a learning and teaching resource, this is not a straight forward matter. We argue that different English language infrastructures present primary mathematics teachers with different challenges for communicating mathematics. Furthermore, we show how the movement across mathematical discourses relates to movement between languages in classroom communication. In this paper, I examine resources and their use in school mathematics. I do so from the perspective of mathematics teacher education and with a view to the practice of school mathematics. I argue that the effectiveness of resources for mathematical learning lies in their use, that is, in the classroom teaching and learning context. The argument pivots on the concepts of school mathematics as a hybrid practice and on the transparency of resources in use. These concepts are elaborated by examples of resource use within an in-service teacher education research project in South Africa. I propose that mathematics teacher education needs to focus more attention on resources, on what they are and how they work as an extension of the teacher in school mathematics practice. In so doing, the report provides a language with which mathematics teacher educators and mathematics teachers can investigate teachers’ use of resources to support mathematical learning in particular and diverse contexts. In this article talk is understood to be a resource for mathematical learning in school. As a resource it needs to be both seen (be visible) to be used and seen through (be invisible) to provide access to mathematical learning. Lave and Wenger’s (1991) concept of transparency captures this dual function of talk as a learning resource in the practice of school mathematics. I argue that the dual functions, visibility and invisibility, of talk in mathematics classrooms create dilemmas for teachers. An analytic narrative vignette drawn from a secondary mathematics classroom in South Africa illustrates the dilemma of transparency that mathematics teachers can face, particularly if they are teaching multilingual classes. Research in Mathematics Education in Australasia 1992-1995 is, in the first instance, a testament to the extensive and wide-ranging research in the field emanating from Australasia, and to the success of the Mathematics Education Research Group of Australasia (MERGA) as the major organisation giving voice and impetus to such activity. As a mathematics teacher and teacher educator,I am concerned not only with improving the quality of mathematical learning and teaching, but also with social justice and equity. In more macro terms, I am concerned with both the growth and development of mathematical knowledge and of democracy, a task made all the more difficult by the turbulence, uncertainty and rapid change, particularly in technology, which are the hallmarks of the contemporary period. This article describes and analyses a short teaching episode in a multilingual secondary mathematics classroom in South Africa where the teacher is using a participatory- inquiry approach. The episode is used to illuminate the general claim that such an approach, because of the particular communicative demands it places on teachers and learners, can create specific dilemmas of mediation. Teachers are often aware of dilemmas they face. However, what can be obscured is how a participatory-inquiry approach can inadvertently constrain mediation of mathematical activity and access to mathematical knowledge. This paper reports on the first stage of a research project that investigates the dynamics of multilingualism and the teaching and learning of mathematics in junior secondary classrooms in South Africa. The paper situates the project theoretically and methodologically and then focusses on an initial set of in-depth interviews with six teachers in three different classroom contexts. The analysis of presences and silences within and across teachers’ accounts suggest that teachers in multilingual contexts confront and produce language-related dilemmas and a paradox as they manage their teaching. These, in turn, raise interesting questions for further analysis and research. This paper is drawn from a retrospective, illuminative case study of newspaper mathematics courses developed by the SACHED TRUST and published as part of a broader newspaper project in South Africa between 1977 and 1980. Background on the project as a whole is given briefly, followed by a discussion of research methodology. An overview of the operation of the mathematics component includes description of the aims, audience and news- paper materials. Research revealed both strengths and weaknesses in the programme. These findings are presented, culminating in some recommendations for the future use of the news- paper as a potentially effective medium for motivating adults to study mathematics. The mathematics education research community in South Africa has grown markedly over the past decade. Key educational concerns have been subjected to systematic study and, increasingly, researchers have become established nationally and internationally. The papers brought together in this book capture some of this growth in mathematics education research in South Africa – in both human and knowledge resource terms. The authors of the various chapters are located across a range of institutional settings and they address a healthy diversity of interest and concerns. While many of the issues raised are resonant with issues in the wider field, each chapter, in one way or another, brings the specificity of the South African context to the fore, and so shapes the questions asked and illuminates the problems studied in particular ways. 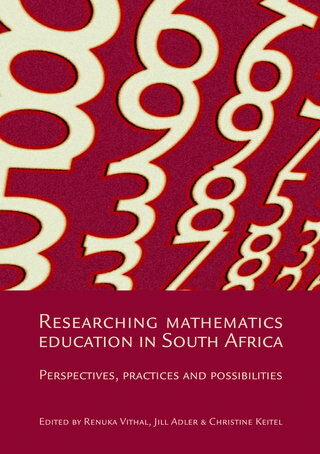 In bringing together these discussions of research issues in this book, we hope, indeed intend, that we have produced a collection that will be not only a resource for graduate students, and those involved in research and policy development and implementation in South Africa, but will also be of value in the wider international field of mathematics education research. What this book has come to be and represent is also a function of how it came into being. The idea for the book emerged some time ago, at the University of Durban-Westville (UDW), when the Faculty of Education developed a proposal in support of Professor Christine Keitel for the (National Research Foundation) NRF-Humboldt scholarship. Christine Keitel is well known for bringing collections of research together into handbooks that have enabled the growth of the international mathematics education community. Her expertise in assisting the community here to collect developing experience into a resource for wider dissemination was one key contribution identified as something that she could offer, should she win the award. And she did. The NRF-Humboldt scholarship is a prestigious award, and this was the first time it was made not only to a Faculty of Education, but also to a historically disadvantaged university. Christine’s input in the conceptualisation of this book and her assistance in its coming to fruition have been a critical part of its development. We have all benefited from the time Christine has spent in South Africa as a result of the award, and these benefits have extended beyond UDW and the development of this book. A first step in its development, and indeed one of the first tasks that Christine undertook on her visit here, was a review of all the conference proceedings of the Southern African Association for Research in Mathematics and Science Education (SAARMSE) and which later became the Southern African Association for Research in Mathematics, Science and Technology Education (SAARMSTE) as a means of beginning to conceptualise a book about research in mathematics education in South Africa. Some of her reflections on this task are captured in the Afterword to this collection, as an outsider’s perspective on South African mathematics education research. Her initial thinking, however, formed the basis for conversations between us as co-editors and enabled us to generate an overall conception for a book and so start the process of soliciting papers. We simultaneously sent out a call (extending here as widely as possible), and invited particular people to respond to the call. The rest is history. The authors who, over time, developed and reworked chapters have not only contributed to the realisation of this initial goal, but each has been enormously patient with a process that has taken longer than we had initially hoped. We thank you! As editors, our task was to work to shape a book, to construct an overall coherence across diverse chapters, while enabling individual researchers and their diverse interests, styles and orientations to come to the fore. We trust we have done justice to this dual task. The publishing of academic texts is a financially fraught undertaking, here and elsewhere. We were, however, determined that the book be published here, carrying a South African stamp on all its features. This book appears through a generous grant from the National Research Foundation for its origination costs, and thanks to the interest of the Human Sciences Research Council in seeing such work come to be part of the public domain. We are most grateful to both these organisations. In particular, we thank Beverly Damonse for her vision and response from the NRF, and John Daniel and Garry Rosenberg of the HSRC. What are Key Elements of Mathematics Teaching, and How do we make Progress to Enhancing their Quality? If you would like to contact me, please make use of the form below.